Industrial production in the A.C. of the Basque Country in September 2007, in homogenous terms of the working calendar, grew by 1.8% as regards the same month of the previous year, according to EUSTAT data. In the first nine months of the year, accumulated growth came to 3.6% in relation to the same period of 2006. 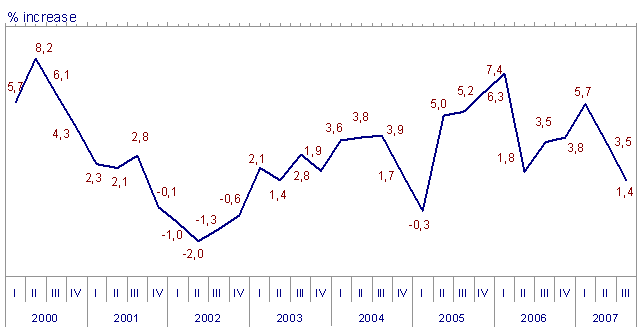 Industrial production in the A.C. of the Basque Country in September 2007, compared to August, fell by 1.6%, once seasonal effects had been corrected. The balance of industrial activity for the first nine months of the year closed with a 3.6% increase in the inter-annual rate, based on the notable performance of capital goods and intermediate goods, and despite the negative rates offered by the energy sector and by consumer goods (especially consumer non-durable goods). By sector, and using the classification of the major industrial sectors, inter-annual evolution of the September 2007 index as regards that of September 2006 shows growth for Capital Goods, which rose 5.9%, and Intermediate Goods which increased by 2.3%. Consumer Goods decreased by 2.2%, as a result of the decrease experienced by both Consumer Durable Goods (-3.1%) and Consumer Non-Durable Goods, which fell by 1.8%. The Energy sector experienced a 5.8% decrease over the same period. Inter-monthly variations in September 2007, in relation to August 2007, were negative for all the major industrial sectors. Capital Goods fell by 3.4%, Energy did so by 1.8, Intermediate Goods diminished by 0.9% and Consumer Goods reduced by 2.7%. Of the two components of Consumer Goods, Consumer Durable Goods experienced a 4.6% inter-monthly decrease, while Consumer Non-Durable Goods decreased by 1.8%. By province, the inter-annual evolution of the Industrial Production Index performed positively in all three, growing by 3.5% in Gipuzkoa, 1.1% in Álava and 0.7% in Bizkaia. Inter-monthly rates, September 2007 in relation to August 2007, were negative for all three provinces: it fell by 2.2% in Gipuzkoa, 2.0 in Alava and 0.9% in Bizkaia.